Bikers begin a 68-mile trip during the Jeff Goen Memorial Ride for Guides, hosted by IAM Local 709 in Marietta, GA. The Jeff Goen Memorial Ride for Guides, hosted by IAM Local 709 in Marietta, GA, took in over $6,000 for Guide Dogs of America, a non-profit organization founded by an IAM member that provides guide dogs to visually-impaired men and women free of charge. 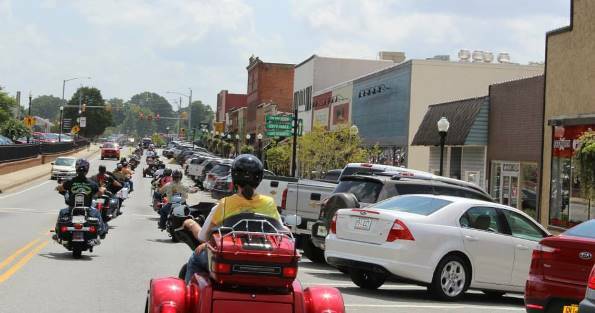 Nearly 50 motorcyclists participated in the 68-mile ride, with many more, including the entire IAM Southern Territory staff, coming out to enjoy a live band, southern BBQ, a silent auction and games. The annual event pays tribute to former Local 709 President Jeff Goen, who lost his battle with prostate cancer in 2009. More photos of the event are available on the IAM Local 709 Facebook page.